Protect Horses and Horse Tack with Steel Metal Buildings for Horse Barns today! When adding to or building a new horse barn, you want to be confident that what you’re purchasing will be affordable and long-lasting. 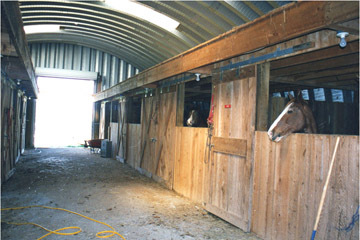 U.S. Buildings offers fully customizable steel metal building horse barns that can suite your specific needs. Our prefabricated metal horse barns can be built in a fraction of the time it takes to build a traditional brick, wood or stone structure because of our easy to follow steel metal building instruction manual. Our metal buildings utilize a steel arch system that can be adapted to your specific equine, bovine, or other farming needs. From livestock to hay storage we want to help you increase efficiency and maximize your investments and your profits. Call U.S. Buildings now to speak to a knowledgeable steel building specialist that can help you determine the right steel metal building solution to fit your horse barn needs. We’re proud to say we’ve helped hundreds of equestrian enthusiasts over the years build much needed barns for their horses. Once you call, we think you’ll agree- U.S. Buildings is America’s number one metal farm building solution. Why Choose a Steel Building from U.S Buildings? Call U.S. Buildings now toll-free at 800-222-6335 to speak with one of our steel building specialists. Be sure to ask about our money saving building specials that could save you up to 60% off your steel metal building. You give us the specifics of your building projects and we’ll provide you with great options, a competitive price and a building that you’ll be proud to show off. Call us now!